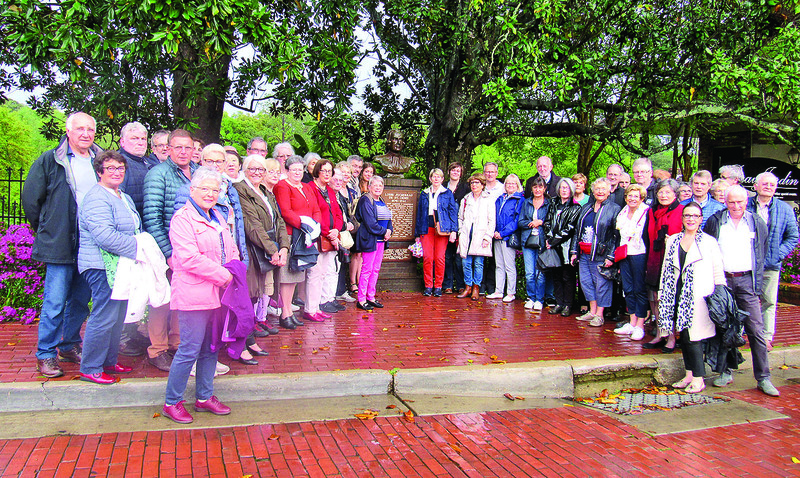 A large group of 44 history enthusiasts from France visited Natchitoches Sunday, April 7. They were members of the Perche-Canada Association, which was founded in 1957 and aims to renew the ties between the inhabitants of the Perche region today and the descendants of the 17th-century emigrants to New France, as well as perpetuate the memory of this era through cultural activities, voyages and supporting commemoration projects. Perche-Canada Association President Michel Ganivet brought the group for a tour of Louisiana, with stops in places related to the mission of the association. What drew the interest of the Perche-Canade Association to Natchitoches is Louis Antoine Juchereau de Saint Denis. Saint Denis is the French-Canadian explorer who founded Natchitoches in 1714. Saint Denis, son of Nicolas Juchereau and Marie Thérèse Giffard, was born at Beauport, New France (present day Québec, Canada). Saint Denis’ grandfather, Jean Juchereau, and his two brothers, had emigrated from the town of Tourouvre in Perche, France. As a young adult, Louis Antoine Juchereau de Saint Denis was sent to France to be educated. Then, in 1699, Saint Denis traveled to Louisiana from La Rochelle, France with his first cousin, the newly appointed governor, Pierre Le Moyne, Sieur d’Iberville. Saint Denis led explorations to the lower region of the Red River and eventually founded the post of Natchitoches. The Natchitoches Historic Foundation coordinated Sunday’s tour at the request of the Perche-Canada Association Sunday. Even though the tour was limited due to the rain, the group still enjoyed seeing the American Cemetery and viewing the bust of Saint Denis on Front Street, before having a meal at Maglieaux’s on the Cane. They also drove by Saint Denis’ home site on Normal Hill on NSU’s campus and passing by Fort St. Jean Baptiste. Members also loved taking photos of Beau Jardin, located behind the bust of Saint Denis and of the tulips on Front Street. “It is very beautiful here,” said Ganivet. Merci, to the ladies and gentlemen who came and enjoyed the sights of Natchitoches!